AQURON 2000 waterproofing for concrete, provides curing and sealing for new pours. Permanently incorporates internal free water maximising hydration and giving improved compressive and flexural strengths, hardened surface, resistance to cracking, antidusting, corrosion resistance. AQURON 2000, provides "Flooring Protection" from moisture related delamination and allows very early acceptance of adhesives and impermeable coverings/coatings. Eliminates need of damp-proof underlayments for more convenient and cost efficient construction. AQURON 2000 is equally effective on aged concretes for moisture & vapour proofing. Proven ideal where tanking failures and rising damp has rotted floor coverings and caused smelly "sick building syndrome". AQURON 2000 inhibits corrosion, carbonation and chemical attack, with tests often showing that hydration has been "restarted" with improved strengths as in new concretes. AQURON 2000 must be applied using airless type high pressure sprayer on existing concrete. 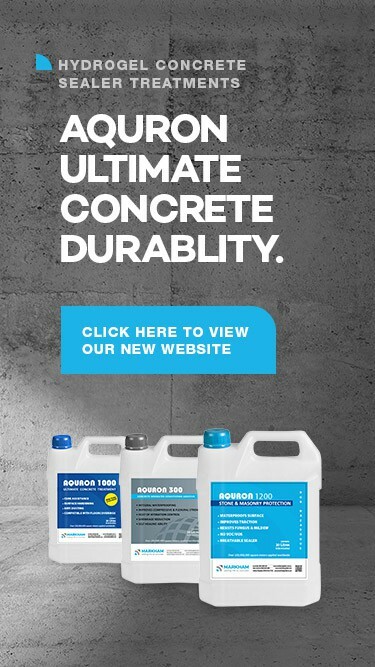 AQURON 2000 waterproofing for concrete has no Solvents, nil VOC's or crystaline silica content. This makes AQURON 2000 waterproofing for concrete the more environmentally safe option, and has had outstanding results in Aquariums, potable water tanks etc.